Skirt Steak is not a common cut of beef here in New Zealand. So when I saw it at the store, I thought I'd give it a go. And for a relatively inexpensive cut, the flavour was really good – and it was a quick cook too. It'll definitely be on the menu again. The cut is one that you have to cook very quickly on a high heat or very low and slow – anything in between and it'll be tough as old boots. To prepare the steak, I first removed any membrane on it. Then I pounded it thin (with a pestle covered in cling film – you probably have a roller). I then mainaded it for 20 minutes in a mixture of balsamic vinegar, soy sauce, mirin, olive oil and pepper. Then get your pan really hot and put the steak in for only a couple of minutes before turning it over onto another part of the pan to do the other side. Let it rest and then slice it thinly – you need to cut across the grain and at an angle . If you look at the pic of the raw meat you can see stripes – that's the direction of the grain so you cut across that. Try and scoff your meat as soon as possible while it is still warm and juicy. Interesting that this is not a common food in NZ. I always think of Australia and NZ as big beef spots. Thanks for sharing your success with it with us. 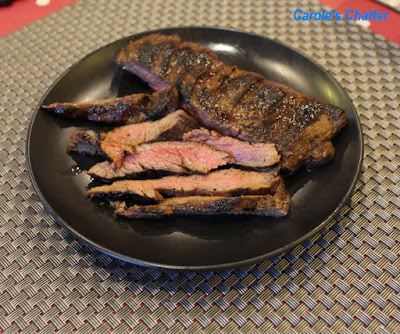 I love skirt steak -- but you're right on how to cook and slice it. Yours looks sooooo good. Use the leftovers for a picnic sandwich (if your spring is warm). Good info on cooking it fast. I usually do the long slow, wrapped around a filling. Looks good, hubby would love it. I'm visiting from Weekend Cooking. I think my problem is I don't get the pan hot enough. 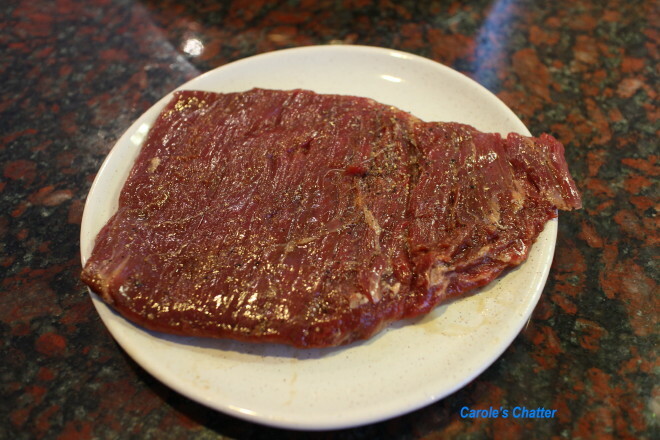 I will give skirt steak another try using this method. The marinade would be good on a charcoal-broiled steak too. And the flames would be even hotter.